Howdy folks… You like Blood? You like Violence? 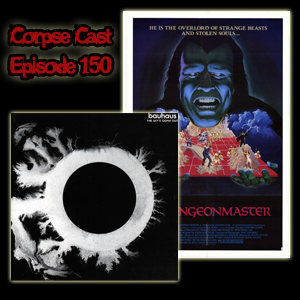 Well then come on down to The Corpse Cast episode 150! Actually, the violence is mostly shooting lasers from a pad on your arm and using your mind to defeat your enemies in Ragewar (aka The Dungeon Master), the film we’re talking about this episode. We’re also talking Goth rock GODS! Bauhaus and their album The Sky’s Gone Out from 1982.